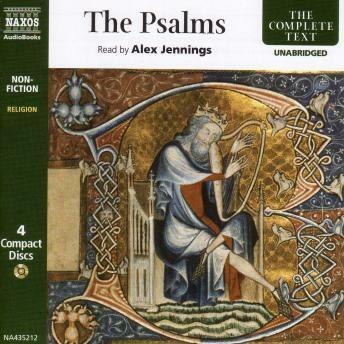 The 150 Psalms contain some of the most inspiring lines in the Old Testament: Psalm 23 'The Lord is My Shepherd' and Psalm 121 'I will lift up mine eyes unto the hills'. Yet few know them as a set, and this recording, in Alex Jennings's clear performance, allows us to consider them as a whole. They are not all uplifting and comfortable. Many involve darker sentiments of revenge or punishment; many appear to be by David or about David; others are To the chief Musician upon Gittith. Their variety is part of their strength and their power, especially in the magisterial language of the King James Bible used here. They are presented with English choral music from the sixteenth and seventeenth centuries. Not otherwise available unabridged on CD.